The same game you know and love in a new packaging format! 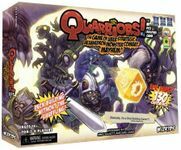 Also includes the updated rules first introduced in the Quarmageddon expansion. This product will replace the original tin packaging (WZK70234) moving forward.